On November 4th a group will travel to South Africa for a two week holiday with a difference. 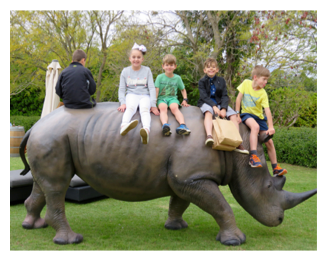 The Gray family, Mathew, Jane and their sons Jonah, Noah, Elijah and Isaiah have made this trip before, and they are all excited to share this experience with four friends who have never travelled to Africa. Joining the Grays on this adventure will be Maire 21, who is a nursing student along with Joel, 20 who is an architectural student. Noah’s fellow “H. Sc survivor” classmates Christopher 18 and Jack 18. This group will be working in our many AAF projects. The goal of this trip will be to give our youth an opportunity to give back to a community which has so much need, working in a camp with many children whose lives have been torn apart by HIV/AIDS. In addition this team of 10 will work in repairing “Zamimpilo,” the campsite we use, scrubbing, painting the huts, planting and mulching our organic vegetable gardens. We expect the most vital part of this visit will be the time they spend with the interns and young people at the camp. Forming new friendships, sharing skills and values they have learnt in their homes. Thank you for remembering this group in your prayers, and we can’t wait to hear of the trip’s success! A busy three months have been spent in worthwhile areas. Schools, Youth clubs, camps and workshops. -Becoming an agent of change, act the way you want to be and you will be the way you act. One of the recent camps had 52 young people attending. The boys were encouraged to look at their role as a responsible man. Substance abuse, health and many other subjects were discussed. 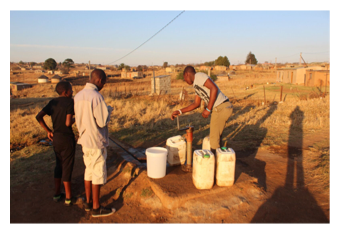 These camps are vital, as it is rare for these boys to have seen good fathering.Vusi Maphalala has become a mentor to countless numbers of boys over the years. The girls are also mentored by our staff, and taught by older women about such things such as teenage pregnancy and coping with the loss of family members. There are many problems where they are in need of help.Another workshop was attended by 43 young people who were starting to work through our Life Skills manual, “Ithembu Lethu.”Many have been transformed by the first topic which is that they are special, unique and valuable. Children who have lost their parents or are living in poverty suffer with feeling stigmatised. Often they are not valued at home, or in their community, so this is a life changing lesson. Another workshop was for our interns. These young people are mentored and taught one day a week, and have regular workshops as well. We continue to be amazed at the the way these interns, from such poor backgrounds, are able to achieve so much, and work so effectively with young people. Our coordinator, Mumsie works very hard assessing and following up needy families to see if they qualify for a garden. If they do meet the strict criteria they are provided with fencing,tools, and seedlings. They also attend nutrition and garden workshops where they are taught the importance of a balanced diet, cooking of vegetables, self-hygiene, and cleanliness around their homes. Lessons to make craft items to sell are also given. Many stories about these people come to us every three months. We often feel emotional about the struggle these people endure in order to survive. 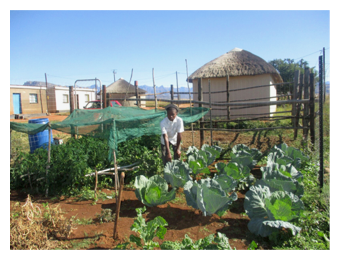 Granny Fakazile lives with her 8 grandchildren She is planting cabbages, carrots and spinach in her garden which helps to feed these children. 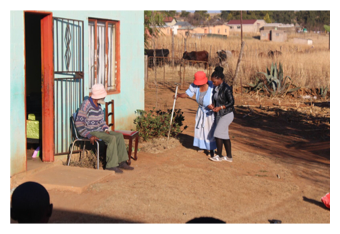 The Hlongwane family live in Moyeni and they have 17 in the family, living in one small house. 3 old people, 3 youths and 11 children. No one is able to work in this family and they rely on the garden, chickens and craft that AAF helps them to make. So many grandmothers have a baby on their backs while they work in the garden. We were blessed to have special visitors from South Africa, Dr Helga Holst and Monika Holst. A combined nearly 80 years of working tirelessly in hospital and community work. We were so happy that this day was a great success. Too many hours of work to count, too many volunteers working tirelessly for months before. So there was great relief all around when it was a brilliant event.Even a sudden storm waited until the function finished to descend upon Burnham Grove, sending umbrellas and our fibre glass African animals toppling. With our funds raised we are making great improvements to our campsite and sporting equipment (check out our Facebook to follow this exciting work)Geoff Hoskin generously arranged for these animals to attend the Afternoon in Africa.We are so grateful to so many people who keep this work going. Without your faithful giving we could not fund these projects. Without our hard working volunteers we would not have funds to use for this work. None of these activities could happen without donations from generous people who support us. We are really happy that we can say that no-one in Australia receives any pay ,or even travel expenses. It is all done by volunteers at their own cost. We are in constant contact with the workers in Africa, and this ensures all this effort is not wasted but changes the lives of many beautiful young people and struggling,elderly Grandparents. Please continue to support us in this work .